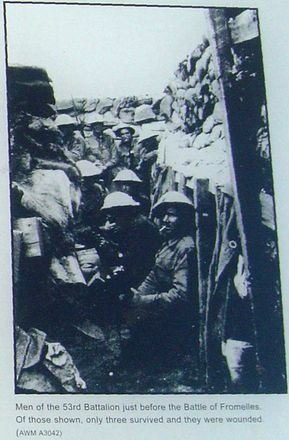 Please read the important advice at the bottom of this page. 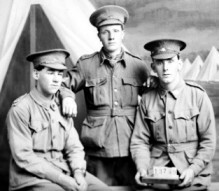 Justin is sitting right, with two comrades, Pte Ernest Charles Hopkinson and Pte Allan James Eldridge who survived the war. 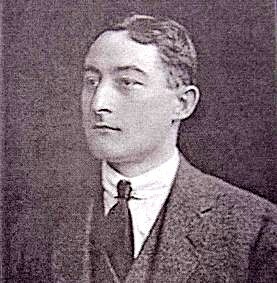 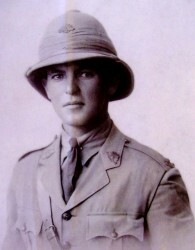 Native of Dewsbury, Yorks, England, he was the son of Wilman and Maria Kilburn, husband of M.J. Kilburn, of 30 Cecil St, Victoria Park, Western Australia. 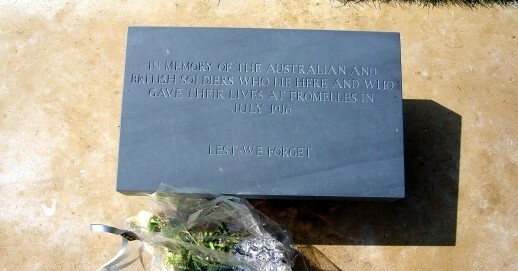 Dedicaced to the courage and compassion which Australians showed at Fromelles. 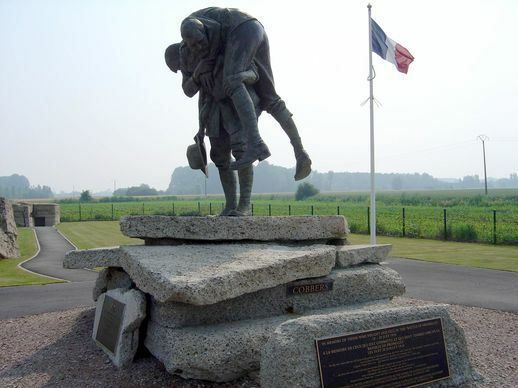 It represents Sgt Simon Fraser rescuing a wounded. 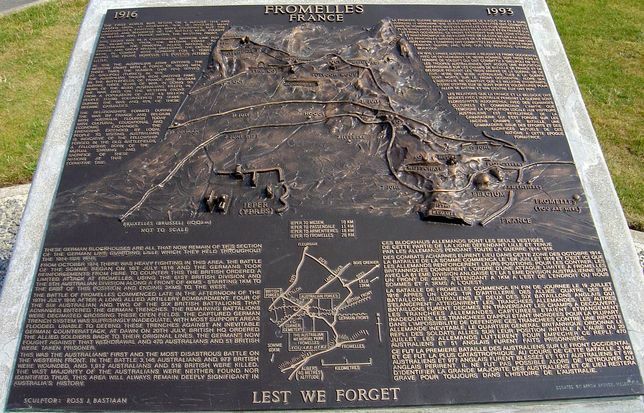 SINCE ITS INCEPTION FROMELLES DISCUSSION GROUP HAS WORKED TO UPHOLD THE ROYAL CHARTER OF INCORPORATION AND SUPPLEMENTAL CHARTER WHICH UNDERPIN THE COMMONWEALTH WAR GRAVES COMMISSION AND THE TREATIES WHICH THAT BODY HAS NEGOTIATED WITH AFFILIATE NATIONS LIKE AUSTRALIA. 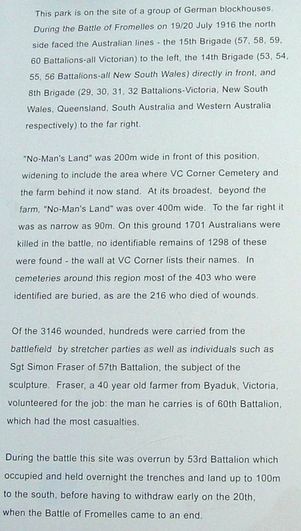 THESE INSTRUMENTS, ESPECIALLY THE TREATIES THAT CAME INTO FORCE ON 26 NOVEMBER 1918 AND 31 OCTOBER 1951 NOT ONLY OUTLINE THE ROLE AND FUNCTION OF THE CWGC, BUT PROTECT THE RIGHTS OF AUSTRALIA'S WAR DEAD AND REQUIRES THE ORGANIZATION TO EXHUME, RECOVER AND IDENTIFY THE MISSING FOUND IN CIRCUMSTANCES LIKE THAT AT PHEASANT WOOD IN NORTHERN FRANCE. 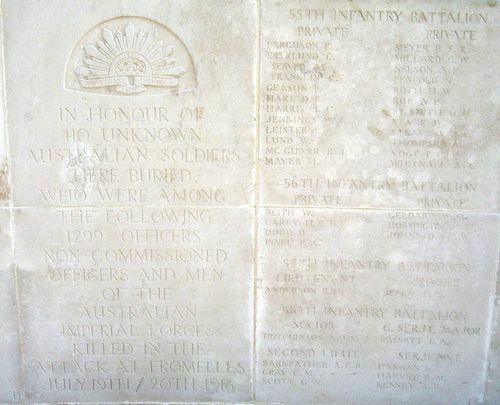 Visit the website and register your support for the identification of all unknown Great War burials related to the BATTLE OF FROMELLES. 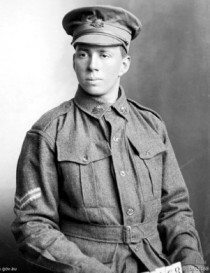 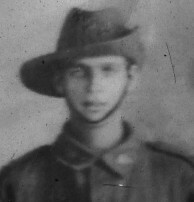 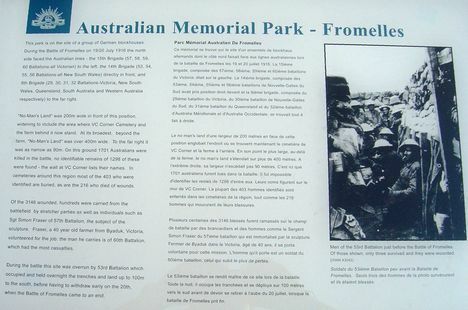 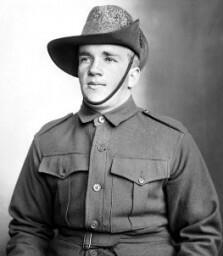 Fromelles Discussion Group was established near the end of 2007 and began operations as an internet platform in February 2008, with the express purpose of encouraging the Australian Government to fulfill the mission of identifying the recently discovered soldiers. 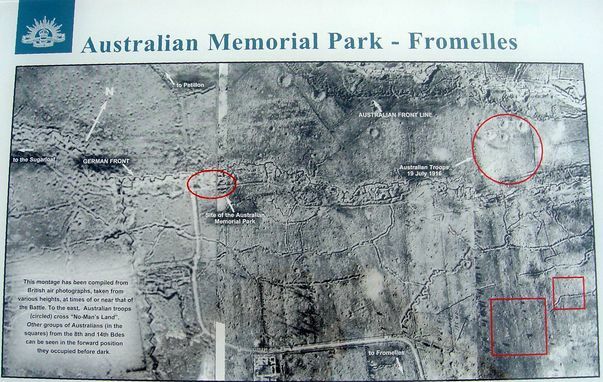 As a result of public lobbying the British and Australian authorities have agreed to test the efficacy of DNA technology on a selection of the skeletal remains found in the mass grave and also (in spite of the generous offer of the current landowner to donate the current site to the Commonwealth War Graves Commission), to share the cost of establishing a new cemetery close by between Fromelles and the burial pits. 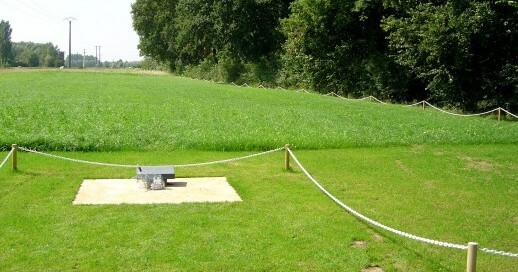 IF You want picture of a particular name, in this cemetery, please e-mail me.